On Wednesday, I had to help Brian from our Louisville office at a job in the area. Essentially, I ferry him around, help him set up his equipment, chat with clients and then sit. With jobs like these, the sitting is mainly what you do. It helps to pass the time if you bring something else to do. I looked over my available items and decided not to bring the cross-stitch. I'd probably lose one of the colors or the fabric would get dirty or something would go wrong. I decided not to bring a stack of magazine. I didn't want to have to keep track of the ones I'd finished. I grabbed the book that's been sitting on the dresser. Compact, easy to carry and easy to be interrupted when Brian needed my help, it was the perfect item. I got half-way through it during the 4.5 hours we did testing for this client. When I finally got home, I read for another 2 hours before I needed to log onto the game and see how the guild was doing. I logged off early and went back to the book. By Wednesday night, I had read 3/4ths of it. I couldn't wait to get home last night and finish it. I was under a deadline because I had a big guild event planned that I'd been working towards since the middle of February. I was running it so I had to be online, but I wanted to finish this book. I did it. I closed the cover with 20 minutes to spare. This is a really good book. If you've not read the first book in this series, The Eyre Affair, that's okay. He does enough plot rehashing that you get the important parts of that book brought up in this one. Thursday Next is a detective who works for Jurisfiction, the policing agency that works inside fiction. The books are set in an odd alternative world, and blends SF, Fantasy, Literature, Horror, and a bit of romance. The series supposes that all the people inside books have real lives when they are not being read, and get up to all sorts of mischief. You have to like fantasy, clever writing, convoluted plots that don't always have an ending and British humor, although the latter is not as much on display as it is with Terry Pratchett. I loved The Eyre Affair and picked up this second book a few years ago. Obviously, I couldn't put it down. If I hadn't had to work Thursday, I would have read the whole thing in a day. I love the idea that literary characters have lives when they aren't being read. Miss Havisham figures large in this book. Jumping from book to book is common place and England is a country run by a huge corporation where personal freedom is fine so long as it's within certain parameters. Dodos and neanderthals and mammoths are common as is time travel. It's a great read and you don't have to know about literature or have read Dickens to get a kick out of the people and places in the book. Oh look! There's the Cheshire Cat and he's in charge of a huge library. 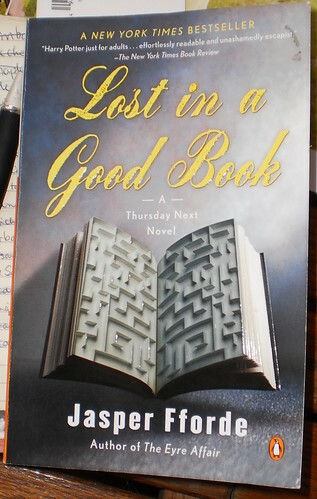 So, I am tempted to get the next book, The Well of Lost Plots, because I want to find out how Thursday is getting on. When I closed the cover on the story, she was living in a lovely seaside resort in a manuscript that hadn't been published. Dare I venture into a bookstore for the next one? They all call to me from the shelves, "Buy me! Buy me! I've got illustrations. I've got history. I've got romance and adventure." It gets so hard to not walk out with a couple more than I came in for. This makes book #3 this year. Now to pick the next one which will sit on my dresser for a couple months until I have need of some stationary reading.